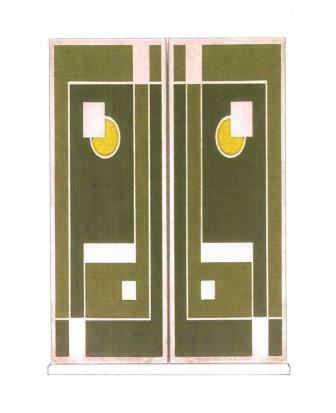 Another very striking Art Deco robe design, this time inspired by a Walter Dorwin Teague design. 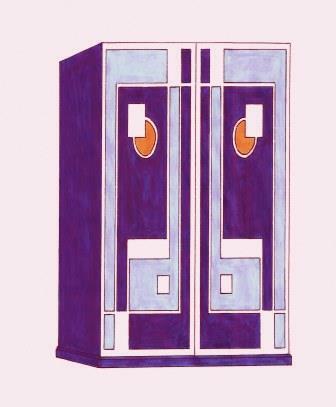 Teague didn't do much furniture design but started a prolific industrial design business. 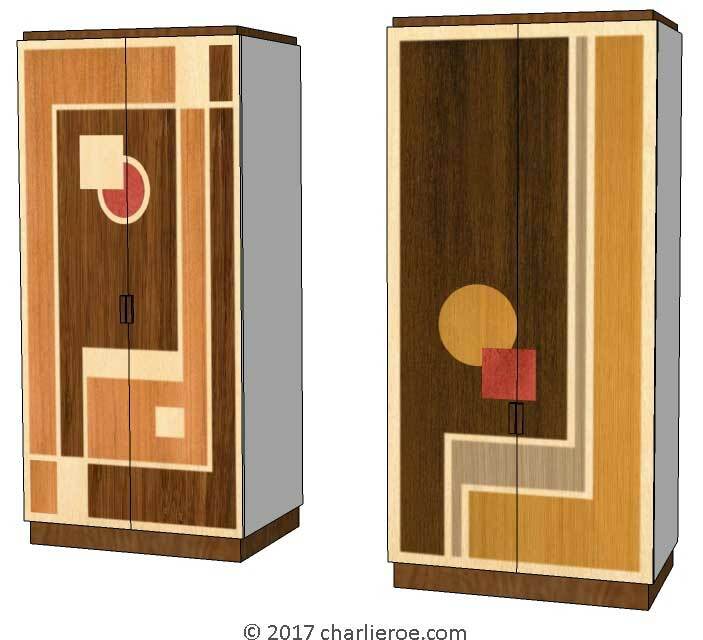 The design we're using for much of these furniture pieces was based on a great pattern he designed for some Kodak cameras. 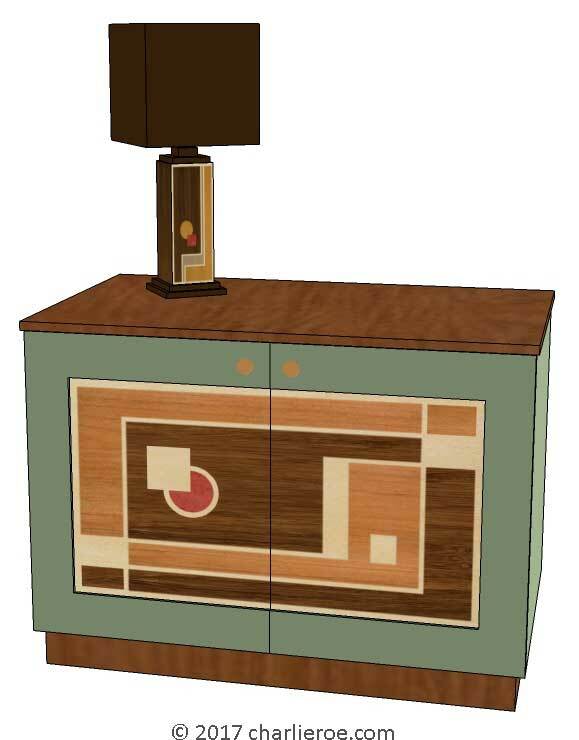 We took the basic pattern and applied it to several pieces of furniture. The design is somewhere between Cubist & Geometric Deco design, in lovely Deco contrasting woods or colours. 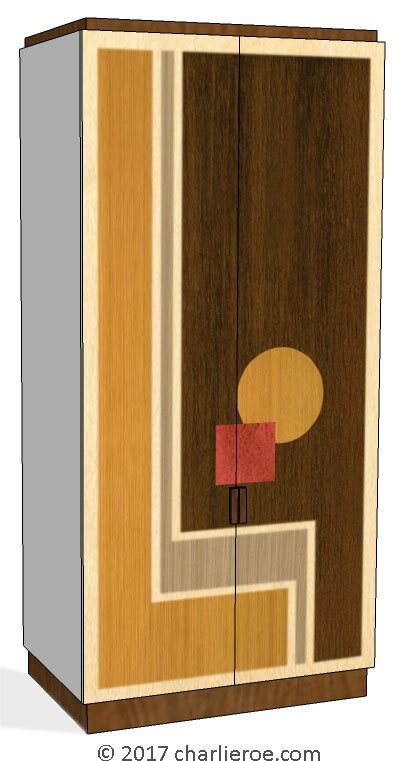 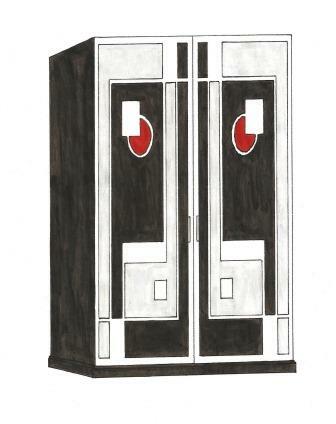 These first few designs have the door designs in marquetry veneers. 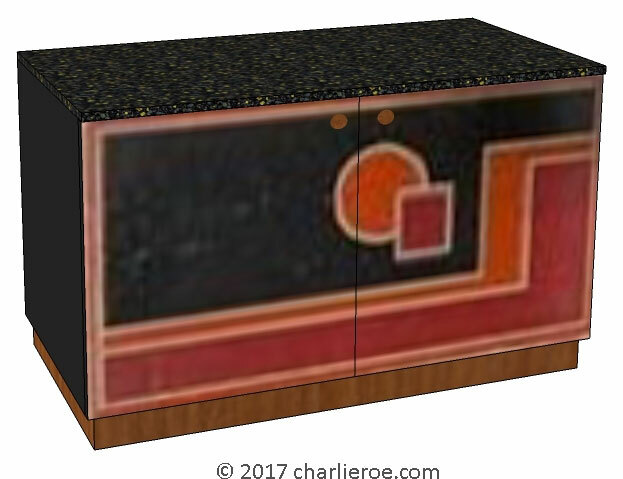 Marquetry work is a highly skilled craft, especially at larger sizes like these,which involves laboriously cutting and gluing 1 piece of veneer to another piece by piece. 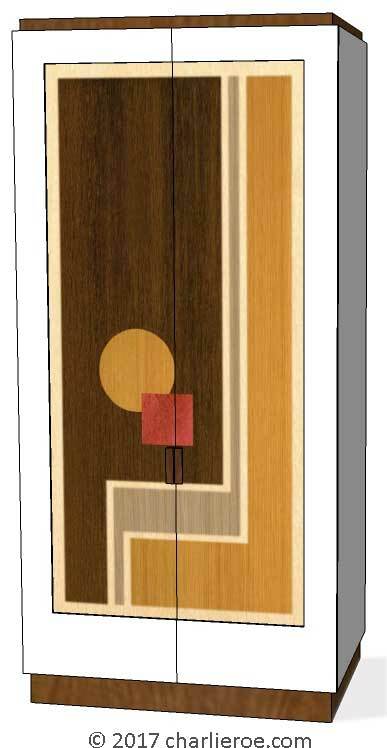 Part of the skill is choosing the right veneers to complement each other, in terms of grain and colour, but still give the necessary contrast for the pattern to work. 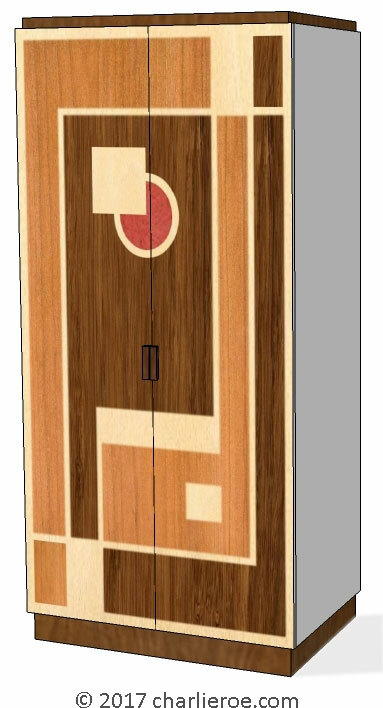 The client is welcome to choose the woods they would like used. We've shown 2 different Teague patterns for the door designs. 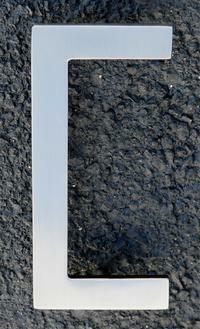 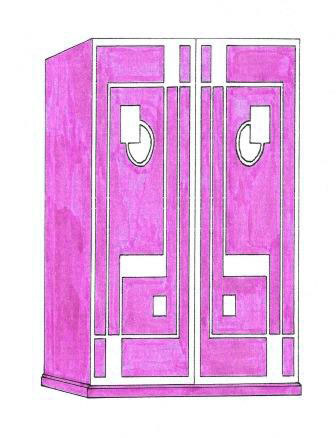 The robe shapes themselves are typical boxy shapes, with set in plinths & top. 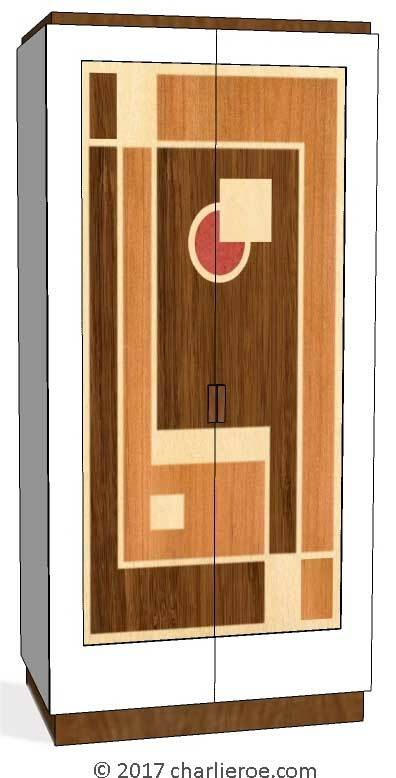 The doors and patterns can be treated in 2 ways, as shown; either the pattern is to the full size of the doors, or the panels can be framed. The framed version, shown below, is an unusual construction as the frames are on 3 sides of the door only, allowing for the main design to run across both doors with 1 frame around the whole pattern. Veneered patterns on the robes give a classier more elegant look - but the painted versions can look great as well (as his original cameras relied on colours for their effect). We can supply other matching furniture to go with these, such as a bed headboard, cupboards, tables - these are shown on the Other Dorwin Teague pages. The robes could be supplied as 2 door, as shown, or 4 or 6 door - if you had a 4 or 6 door robe it would probably look best with just one robe having the Teague design (it would be visually busy to have this pattern on every robe). They could be freestanding or built-in. 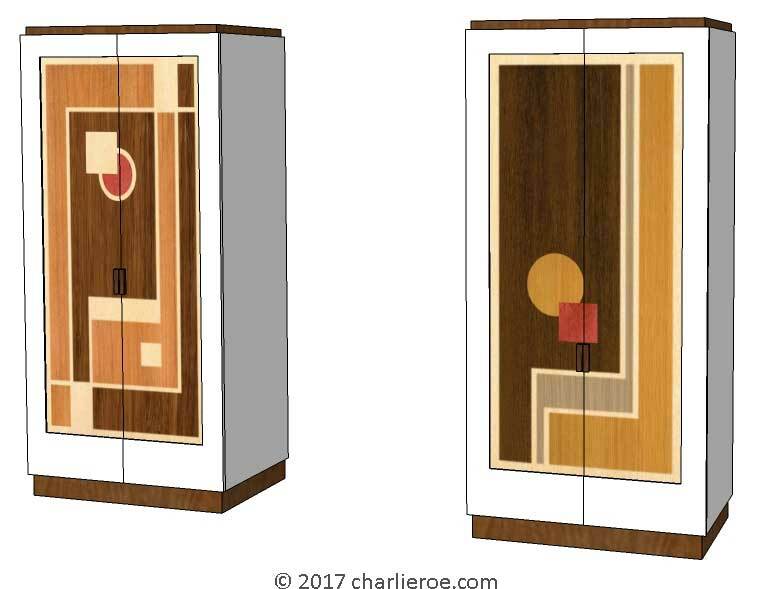 We can fit out the robe interiors as you want. The robes can be varied in size, so long as the pattern looks in proportion. We don't discuss prices until we've agreed a spec with a customer. We can work with clients anywhere in the world no problem.